I’m a big fan of spiralizing vegetables for Paleo noodles. It gets me a larger variety of vegetables, and I feel like I’m eating pasta. Usually, I’ll make a small amount of pasta and during the last minute of cooking, I’ll toss in the spiralized vegetables. It cooks them up perfectly. You can find the all the recipes here. 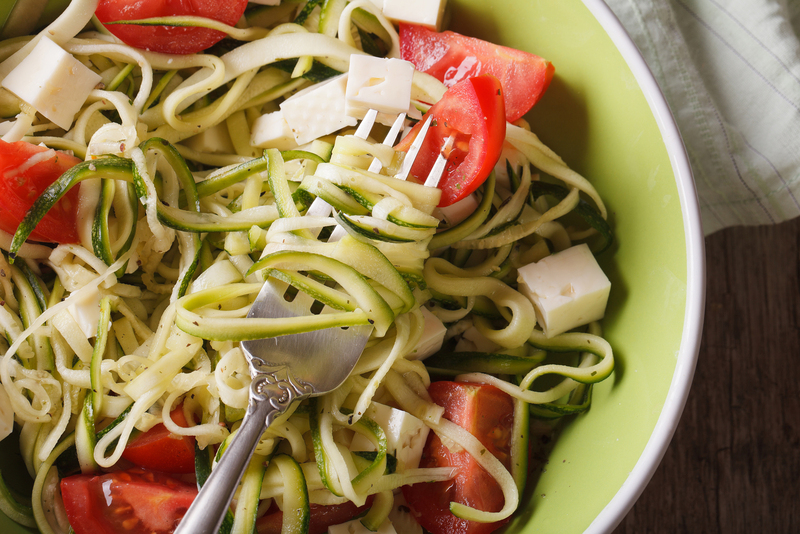 It’s something to inspire you to want to use the spiralizer more. You can make a wonderful salad by spiralizing cucumbers and serving with cherry tomatoes and a tzatziki sauce. Spiralizing sweet potatoes are another great replacement for pasta. It has a more toothy feel to it. You will need to cook it longer than summer squash. I spiralized cabbage to make sauerkraut. My husband loves my fresh sauerkraut but he prefers it to be chopped smaller. And I can chop it finer, but why? I can easily use my KitchenAid spiralizer attachment. Want a fun dessert? Spiralize an apple and toss with some sugar and cinnamon. Then bake until soft. It’s so good. Cut the noodles after you spiralize them. You don’t want to be cutting while you’re in the middle of creating the noodles. edium sized vegetables rather than larger ones. And be careful of too small ones. But that’s only generally speaking. You will need to test with your particular spiralizer. I’ve used Vegetti, Spiralizer, and the KitchenAid spiralizer attachment. I liked the Vegetti because it was simple for some quick zucchini noodles. But it wasn’t easy to use for harder vegetables. The Spiralizer had a lot of different blade types and was more flexible. However, I don’t have a good countertop, so I couldn’t get it attached properly. And the KitchenAid is like a hot knife through butter. I have to just be careful with how fast I have the motor going. Peel the hard vegetables like carrots, beets and sweet potatoes before you spiralize them. And then cook them. Don’t cook a vegetable before you spiralize them or you’ll have a hot mess. Dry your vegetables after you spiralize them. This is most important for summer squash like zucchini and cucumbers, otherwise you’ll have a soggy salad or bowl of pasta.